Many video slots feature animals in the lead role, but there are not many games featuring a glamorous cat as the lead character. Miss Kitty video slot is probably one of the most excellent animal themed video slots powered by NextGen Gaming. It works on a 5-reel and 50 payline platform, where coin size ranges between 0.50-100.00. 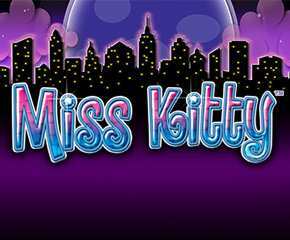 Maybe, you have recently started playing online video slots and you don’t want to take major risks, Miss Kitty is a perfect choice to play in a risk-free way. This video slot is famous for its free spin feature in which you can also land on stacked wilds on reels 2, 3, 4 & 5 and get a chance of winning the highest prize of £100,000. You are now in the city of Miss Kitty, where a bright slot machine is featuring many opportunities of earning some luring prizes. The night view of a city is shown in the background that is beautified by purple clouds. NextGen gaming is renowned for their perfect use of HD graphics in its video slots and that’s what it did in this video slot. You can find some cartoon characters in the role of high value symbols like a woolen ball, carton of milk, a parrot, wind up mouse and a goldfish. These high value symbols represent the favorite preys of Miss Kitty. In addition, lower amount rewarding symbols include 9, 10, J, K, Q and A. A pink cat with wide eyes is miss kitty, who plays as the wild symbol in this game and transparent moon’s symbol is the scatter symbol that triggers free spin rounds during the base game. You can gain 10 free spins if you successfully land on three scatter moon symbols. It is the main term of initiating free spin feature, but you can increase the number of free spins by landing on more transparent moons anywhere in the spinning reels. In case, you on land a wild symbol during the free spin round, it freezes and remaining symbols of the reels spin to create a bigger winning sequence. 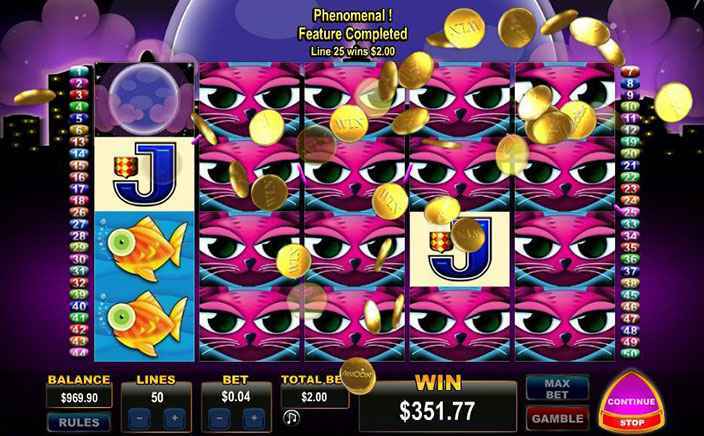 Another bonus feature with free spin can reward you with five more free spins; all you need to do is land on the scatter symbol just below Miss Kitty wild symbol. It can activate some random prizes along with more free spins. Yes, this video slot allows you to gamble more and win more prizes by clicking on the Gamble button below the Max Bet button. Game draws a playing card and it asks players to guess the color or the suit of the card. This gamble feature can double or quadruple the winning amount. NextGen Gaming’s Miss Kitty video slot has an impressive 94.76% RTP along with low risks of losing applied bets. It is entertaining and certainly a hugely rewarding video slot.